#13 BU begins a crucial home-and-home series against #12 UMass-Lowell tonight at Agganis Arena in a 7:30 p.m. start. In the tightly bunch Hockey East standings, BU,is tied for fourth place with Providence, but just three points behind leader Merrimack with a game in hand. The River Hawks are two points behind BU. The Terrier lineup will remain the same as it was for the Maine series with the exception of senior Jake Moscatel, who has recovered from a shoulder injury, returning to right wing on the fourth line. Matt O’Connor, who stopped 33 shots in last Friday’s 3-3 tie with Maine, will be in goal for BU tonight with Sean Maguire getting the start at Lowell tomorrow night. Joe Pendenza and Scott Wilson lead Lowell offense with 24 and 23 points respectively and freshman goalie Connor Hellebucyk leads the league in GAA (1.75) and save percentage (.935). For BU, sophomore Cason Hohmann continues to be the point leader with 28 and also has the best plus/minus with +16. Freshman Danny O’Regan has 26 points and senior captain Wade Megan’s total is 24, including a team-high 14 goals. 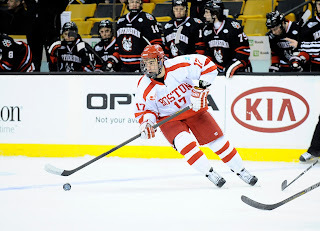 Sophomore Evan Rodrigues (photo) has had a hot stick for the Terriers with a 6-7-13 line in his past nine games. In the teams’ first meeting of the season on January 19, a third-period BU comeback fell just short, when Matt Grzelcyk’s shot hit the crossbar and the River Hawks escaped with a 4-3 victory. 2013 recruit Kevin Duane scored twice and assisted on the game-winner for the Junior Bruins in a 5-2 win against the Boston Bandits. The 6-4 right wing has a 13-15-28 scoring line in 25 games since joining the Bruins. David Van der Gulik scored twice and added a pair of assists to earn top-star honors in AHL Lake Erie's 7-1 win against.Milwaukee. IslandersOptimism.com discusses the impact former BU assistant captain Brian Strait had on the New York defense prior to breaking his ankle last weekend.